Ideal for on-set quality control and colour management this lightweight and robust 24-inch, 4K reference display offers superb image quality with HDR capability and fits seamlessly into 4K production workflows. Discover what the experts think about the DP-V2410, to watch the full ‘Trickshot’ movie, please click here. The DP-V2410’s newly developed 24-inch, (4096x2160 resolution) IPS LCD panel is DCI 4K and UHD compliant and matches the output of DCI-compliant digital cinema projectors, thus offering a versatile and cost-efficient on-set display for 4K cinema and broadcast production workflows. Thanks to minimal changes in colour and contrast across the IPS panel the display operates through 89° in all directions (up, down, left and right), thus delivering a wide overall viewing angle of 178° – this is ideal for when many crew members may need to check image quality at the same time. The display offers 4K viewing of footage shot at 50p, 60p and 48p frame rates, thus being compatible with all of the major 4K UHD video workflows for broadcast and cinema productions. The colour gamuts of multiple broadcast standards are supported including next generation ITU-R BT.2020 and the DCI-P3 digital cinema standard. The display supports ITU-R BT.2020 colour matrix (constant luminance) by converting consistent luminance YUV signals to linear signals and then converting them to RGB signals and, finally, adding gamma. This process allows for the monitoring of images recorded with constant luminance. The newly developed high-contrast IPS LCD panel and Canon’s image processing technology combine to achieve a high contrast ratio of 2000:1 – this has been further improved via a firmware update*. Accurate reproduction of gradation ensures faithful display of dark images, such as shadow detail or night scenes. A Contrast Boost function instantly increases display brightness in bright locations. 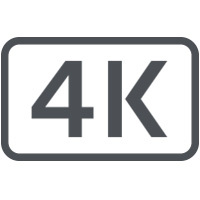 The 4K display supports the latest Academy Colour Encoding System (ACES) colour management standard (Version 1.0), which is becoming widely adopted in production, post-production and archiving workflows. In addition, by sharing the Colour Decision List (CDL) data using a USB connection, the signals output by on-set grading and editing set-ups have the same colours and gradations, so the ‘look’ intended at the shooting and/or editing location can be maintained throughout the post-production workflow. The display also can be used with any source input that complies with ACESproxy encoding. Within the unit’s selectable preset gamma settings support for the gamma standard ITU-R BT.1886 is offered, thus delivering advantages such as a closer match between different video displays so that the same video signal will appear more consistently on different displays, the best opportunity to view video content as it was originally produced and clearer differentiation between the first few steps out of black. Canon's advanced control system automatically and consistently corrects any changes in colour and brightness that can occur over long periods of time, to ensure highly stable and consistent display performance for years to come. Following high-precision factory alignment, the DP-V2410 4K Reference Display can be calibrated easily and conveniently – within the Picture Mode menu when ‘User 1-7’ is selected – without the need for an external PC workstation. Using a third-party external sensor, users can calibrate the display in accordance with viewing environment and application for luminance, colour temperature, colour gamut and target gamma. 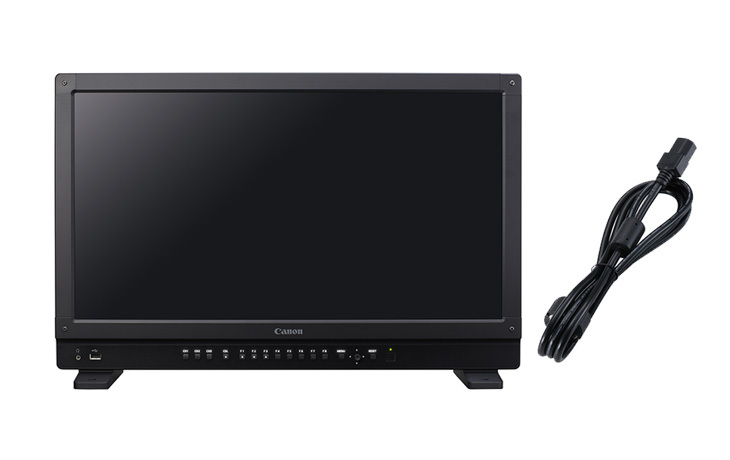 A built-in debayer enables compatible Canon Cinema EOS cameras to be connected directly to the DP-V2410, easily reproducing and monitoring stunning full 4K RAW data (up to 60p) in real time on the display. This saves on the cost of an external debayer unit and makes for a smaller and simpler set-up, ideal when mobility during a shoot is required. In addition, the camera’s metadata can be acquired and displayed, while an image quality linkup function automatically synchronises the colour settings from a compatible Canon camera to the display, preventing settings errors. The DP-V2410 offers an extensive range of 4K capable on set functions including a Waveform Monitor and Vectorscope, which displays the input signal, superimposed onto the screen. The signal level is displayed using the Waveform Monitor function (six types: Y, Cr, Cb, R, G, and B), whilst the two colour difference signals (Cb and Cr) are each displayed with ‘X axis/Y axis’ when the Vectorscope function is engaged. The Waveform Monitor is also optimised for HDR* with support for Canon Log, Canon Log 2, Canon Log 3 and SMPTE ST 2084. The Audio Level Meter function is able to display audio signal levels with up to eight channels. This provides a clear, instant visual representation of how loud the sound is being picked up by the camera’s microphone/s. The DP-V2410 also includes a stereo mini-jack for headphones. For transporting 4K via quad link signals the DP-V2410 uses the 2-Sample Interleave Division*, which uses four sub-images and alternates the samples every two pixels and every line instead of slitting the image into four quadrants. False colour assists in setting the camera’s exposure by displaying the input image using colours that differ according to their luminance level. For example, over-exposure (above 100% luminance level) is indicated in red and loss of dark detail (under 0% luminance level) is indicated in blue. The DP-V2410 offers support for multiple 3D and 1D Look-Up Tables (LUTs) for accurate and consistent colour matching between individual displays, as well as using customised 'looks' that have been created by third-party colour-grading applications. Multiple LUTS can be set up per picture mode giving users the ability to rapidly compare up to eight different LUTs without having to change the picture mode. The DP-V2410 supports the ability to display High Dynamic Range (HDR) footage captured by Canon's proprietary Canon Log and Canon Log 2, which helps to maximise retention of the original colouring and brightness of the recorded subjects and HDR EOTF recommended by the SMPTE ST 2084 standard. The HDR display function allows users to view both extreme highlights and shadow detail of scenes at the same time, together with rich mid tones, for a more natural and realistic image. Filmmakers can also check and compare Standard Dynamic Range (SDR) with HDR images with the ability to verify the final image quality at the shooting location – thus helping to maximise efficiency in video production. In addition, a unique HDR range function provides the flexibility to adjust the displayed dynamic range based on the HDR EOTF. The DP-V2410 supports* the new Canon Log 3 Gamma when used with the EOS C300 Mark II Digital Cinema Camera. Canon Log 3 achieves a dynamic range of 1600% with 14 stops of dynamic range and can be ideally suited to filmmakers working on a limited post-production budget who need a quick turnaround. The display natively supports ARRI Log C* and metadata from ARRI cameras is parsed and can be shown on the DP-V2410’s screen. A camera link-up function automatically switches the image quality of the display based on the camera’s metadata. If any image quality settings are changed on the camera the display will automatically change to match the camera. With a robust, lightweight design – weighing just 12kg – and a sturdy handle the DP-V2410 is perfect for on-set quality control and colour management, where portability and size are key factors. With support for a common 24 volt DC power input via a rear terminal the display unit is easily connected to a DC power source. The unit’s wide range of connection options include a high bandwidth HDMI interface for fast transfer speeds from compatible Cinema EOS cameras enabling transmission of 4K (up to 60p) images via a single cable. The connections also include four 3G/HD-SDI connectors, a USB port and a LAN terminal. The DP-V2410 also supports 3G-SDI Dual Link (Level A, Level B) signals. The built-in control buttons and jog dial, located on the front panel of the DP-V2410 4K Reference Display, are laid out in the same positions as they are on the CL-01 Display Controller of the DP-V3010 4K Reference Display. The labels and buttons are illuminated to enable easy operation in dark areas. Functions can also be registered to the function buttons in accordance with the intended applications and frequently used functions can be called up and used at the touch of a button. The on-screen display (OSD) menu and control layout of the DP-V2410 is designed to deliver clear, unambiguous, at-a-glance communication of visual information. Users can also change OSD positions according to the resolution of images displayed. The DP-V2410 display can now show two images side-by-side. Users have the choice to select different functions for either image, such as Log on one but not the other or peaking on one but not the other. 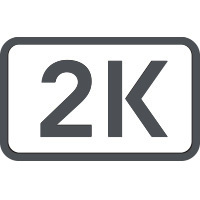 The 4K Reference Display now also has the ability to display four separate inputs at one time on-screen. The display’s original zoom presets 1-3 mode can preset magnification up to 2x and be positioned in up to five points. Improvements in the unit’s Zooming Function* now offer additional 4x and 8x zooming capabilities with movable positioning across the screen. Much cinema and commercial production work still uses HD and 2K video and the display is equipped with three types of screen scaling functions, including Canon’s Shape Tracing technology that helps to minimise artifacts on images scaled on the DP-V2410. Using the technology, the DP-V2410 detects the angles of hard edges and selects an appropriate interpolation to help to provide smooth diagonal lines and optimal image rendering, further extending the display's application during location or studio shoots and within colour-grading, DI, CGI, VFX and other post-production workflows. Click through to find out your nearest authorised Canon centre for Cinema EOS service and support. * Features to be included in DP-V2410 4K Reference Display via scheduled firmware update in July 2016.